We can see just how nervous some investors are by the chart below. It is a 30 min. 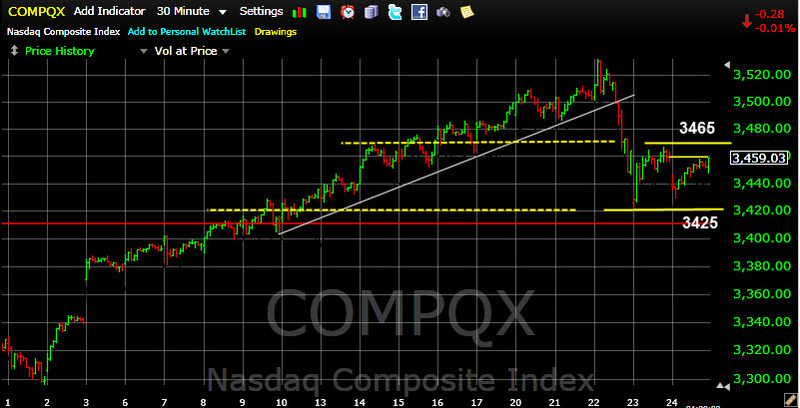 bar chart of the NASDAQ Composite Index. Note the peak last Wednesday. The first hour it was roaring up as Ben Bernanke gave his statement to the Congressional Finance committee. But after lunch, at 1:30pm EDT as he got into the Q&A portion, folks got very nervous. Will the FED raise interest rates? (yes, eventually, of course) Well to some it sounded like rates were going up tomorrow and the rush to sell started. Within a few hours traders started to “dog pile” onto a move down and away we went. After the markets closed the selling continued in Japan (an over heated market), then Europe joined in. As you can see the damage was done on Wednesday. Thursday and Friday just bounced around between 3465 at the top and 3425 near the bottom. Volume did pick up on Wednesday as supply came into the market but quickly tapered off the rest of the week. IF this was a major sell off I would have expected the selling to continue, but it has not (at least not yet). You can tell I’m just a little skeptical about the call for a sell off here. Yes, the market was waaay over priced and a move down was anticipated, but this move came sharply, intraday and on “news”. There was no follow thru the next 2 days, so “I’m from Missouri” on this one (“show me”). While my market model remains Bullish, it did get close (again) to turning Bearish, and it won’t take much to push it over. Let’s watch the support levels of the previous Lows (which go back a few months as shown by the dashed lines). We may see a short “Shake Out” breaking these lows briefly intraday, but the line in the sand is there. Let’s observe the markets in Japan and Europe on Monday, then see how the US reacts when it opens up on Tuesday next week. I thought readers would like to see where the S&P 1500 stocks were after this blip down. 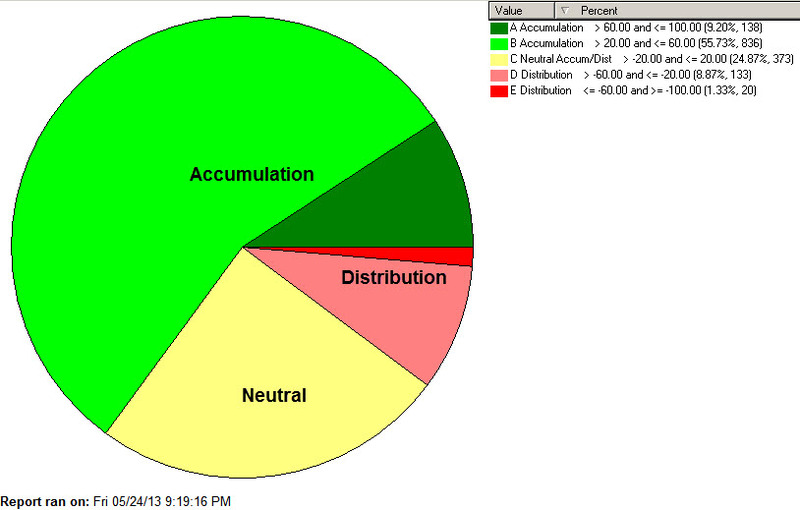 The Money Flow chart remains strong and the Price Strength below it is at the worst, Neutral. So not much damage was done, they do not show a wholesale rush for the exits. 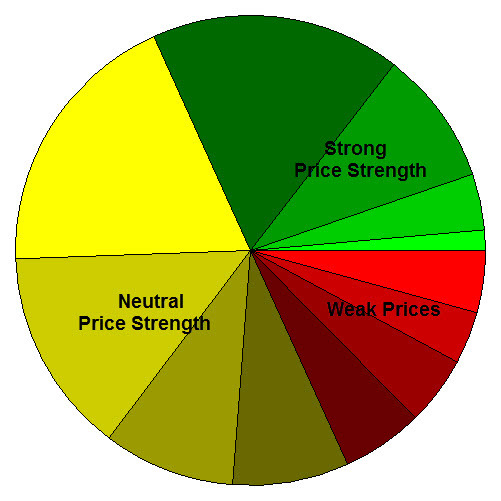 Price chart by Worden Bros. / TeleChart; pie charts by www.HighGrowthStock.com . All used with permission. Click on graphics to enlarge them for easier reading.